As previously said I started painting when I was pregnant with my first baby and the very day my son Kai turned one years old we set off travelling by car to Katherine in the Northern Territory. We had his birthday party on the Sunday before and then said our goodbyes as my husband was going to be working on the Tindal Airbase where houses for the air force were currently under construction. 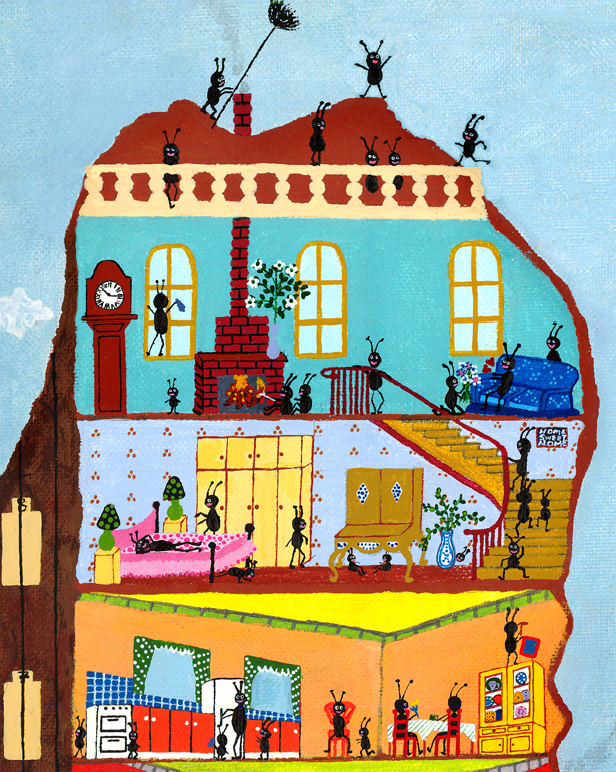 This is how the Ants really live - in apartments! The distance was only, lol 3000 kilometers, this country Australia is big remember, so we figured we should do it in 3-4 days without too much trouble. The first night we spent in a dug out, that’s the way most people of Cooper Pedy live in what seems very much like a normal home but completely underground. The town inhabitants are mainly opal miners and other essential services that support the town of about 5000 people. When you first get there you think it’s a deserted place as all you can see is holes in the ground and something poking out of the ground which is actually the ventilation shafts that go down to all the rooms (looks like a small white plastic pipe). There are some larger ones to let a bit of light into the kitchen and living rooms. We stayed the night in a dug out motel, it was lots of fun but I have to admit I felt just a little claustrophobic; however it was totally silent and very cool. The temperature can get to 50 degrees in Cooper Pedy so it is a very clever way to keep cool without air-conditioning. The next day we kept driving and in the end it took us 4 days to reach Katherine, the whole way I was excitedly looking out for the rainforest and the palm trees which I mistakenly as it happened thought would soon appear on the horizon. But oh no that is up Cairns way and the closest we got to that tropical feel was in the very picturesque Mataranka Thermal Pool. Now that is my idea of heaven, a virtual oasis in this very bare and hot landscape sprouts a palm forest with a natural pool which is a constant 34 degree fed by a spring. I could have stayed there for a month at least! What so fascinated me when we first got up to the Northern Territory was this great big mounds made of clay by the termites. To me they seemed like little cities with skyscrapers full of little apartments and I just could not get the image out of my mind. I saw all the ants, living in their little flats, going about their business, making meals, house cleaning, having a sleep and going about their days just like we do. So of course I had to paint it. The image has been very popular and was also used in a book published by McGraw-Hill Publishers called Art Smart written by Lou Chamberlain, there I had my own chapter in a field of the great artists like Picasso, Miro and Da Vinci, and so you understand I was rather pleased. The termite “homes” are usually referred to as Anthills here in Australia and they grow very large in the Northern Territory. The ants mix saliva and mud together which becomes like cement (the ones I saw were red oxide in colour) and can take over 50 years to finish, and can contain a few million ants. So I probably gave them bigger apartments then they are used too, lol. 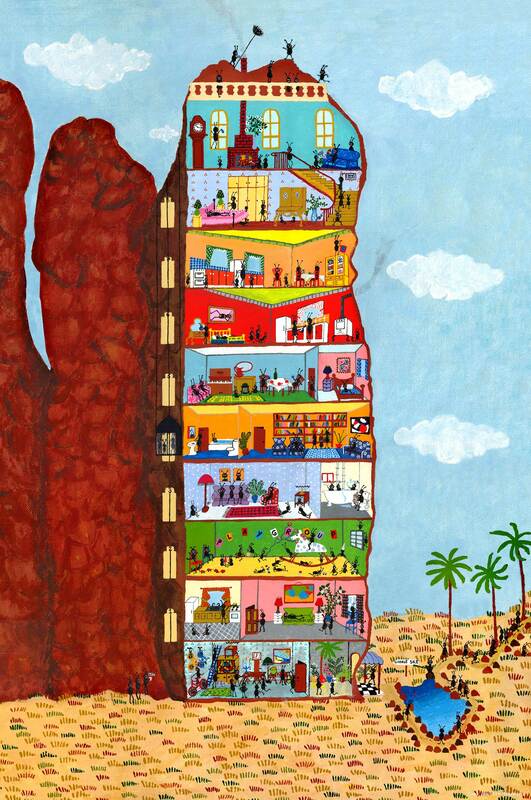 However the termite nest can actually stretch up to 10 meters underground apart from what we can see aboveground, so perhaps that was where the opal miners of Cooper Pedy got their dugout ideas from? The ants also have lots of tunnels that act as an air-condition system and also contain indoor gardens, nurseries and it goes without saying that the Queen has her own chamber! Here is another travel art blog that you may enjoy 6. San Francisco Art Blog with more artworks and fun.